Hamster and Dog are back to celebrate Hamster's birthday! Pink cake, blue cake, chocolate through-and-through cake. Short cake, tall cake, cannot-eat-it-all cake. 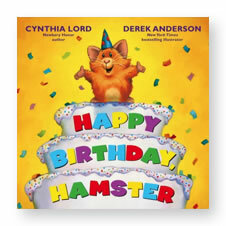 Newbery Honor author Cynthia Lord and NEW YORK TIMES bestselling illustrator Derek Anderson return with a tale chock-full of fun rhymes and hilarious artwork about Hamster's favorite day: his birthday! But is it possible that Dog and his friends have forgotten all about it? Not a chance. Join them as they plan the best surprise birthday party ever! Story County: Here We Come! Welcome to Story County! Farmer, Dog, Pig, Chicken and Miss Cow are eager to make a farm. And it's no ordinary farm. They paint the barn a rainbow of colors plant crops of jelly beans and candy corn, fashion the prettiest scarecrow and more, until presto!- the farm is complete. Or is it? 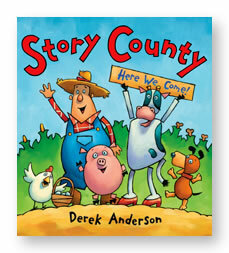 New York Times bestselling illustrator Derek Anderson takes readers from white page to colorful farm in this charming tale of friendship (and teamwork), as five friends come together to create Story County- a special new home for young readers, where anything can happen. 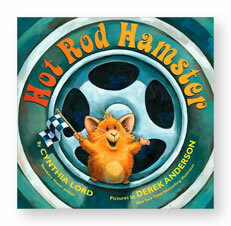 Newbery Honor-author Cynthia Lord and New York Times bestselling illustrator Derek Anderson put the pedal to the medal in this endearing, rhythmic, rip-roaring race to the finish line where a hamster creates a sizzling hot rod with a little help from his new furry friends and YOU! 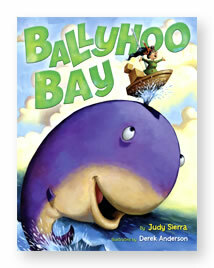 Welcome to Ballyhoo Bay, where Mira Bella the artist teaches painting and sculpture to grannies, kids, swordfish and squids. Sun, sea, sand and sky- what could be more fun? Until one awful, gray day a billboard goes up, announcing plans for a new high-rise building right on the beach. No more sand or seashells or painting or fun. And there's absolutely no children or wildlife allowed.Mira Bella is not one to take this plan lightly. Can art save Ballyhoo Bay? All aboard! 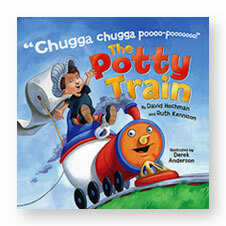 It's time to say good-bye to diapers and take the journey to Underpants Station. Though there may be leaks along the ride, and sometimes you can get off track, The Potty Train is a wholly original way to cover all of the issues that arise during the potty-training journey. 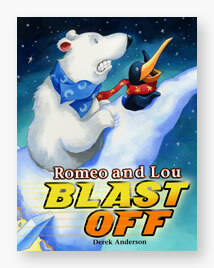 Romeo the penguin and Lou the polar bear are looking for something new and fun to do. One snowy, blowy day they build a pretend rocket ship entirely out of snow. But when their "imaginary" rocket ship crosses paths with a shooting star, they are carried off to a strange new world. And the real question is: How will they ever get home? Come along and let your imagination blast off on an unforgettable winter night's journey. When Santa has a mishap with a toy train on Christmas eve, he's unable to make his deliveries. 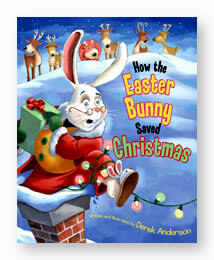 But Mrs. Claus thinks fast and calls on the only other fellow who knows the route- the Easter Bunny himself. Thankfully, the bunny hops over to save the holiday. Still, between shivering in the winter weather, putting presents under the wrong trees and getting stuck in the chimney, this wacky bunny gets Christmas off to a slippery start. Will he manage to saved Christmas after all? Join the Easter Bunny and Santa's all new team of reindeer on a rollicking holiday trip that you won't soon forget. Who says a bird and a worm can't be best friends? No one in the great north woods. Blue Burt and Wiggles are inseparable! But when the air turns cool, and the other birds head south for the winter, it's only a matter of time before Blue Burt needs to say good-bye too. Or is it? 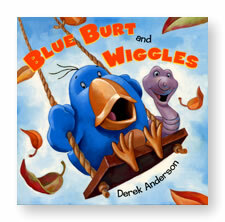 Join Blue Burt and his trusted pal, Wiggles, on their hilarious quest to make summer last forever. Widdle, Waddle, Piddle, Puddle and Little Quack think there's nothing more fun than playing with one another. But one day a new creature splunks into their pond. He RIBBITS, he LEAPS, and he's GREEN! At first Little Quack is shy. 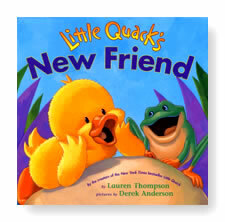 But pretty soon he just might be quacking and ribbiting a new tune: MAKING FRIENDS RULES! 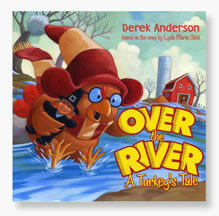 Over the River Mama, Papa, and Baby Turkey embark for their vegetarian Thanksgiving feast. But when a hungry boy and his dog start sniffing around, the turkeys have got to think fast before they become the main course! 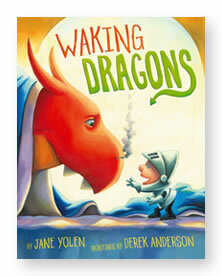 Readers of all ages will be wondering who's going to gobble up whom until the dessert finale. Gladys loves bananas. She eats bananas for breakfast, bananas for lunch and bananas for dinner. 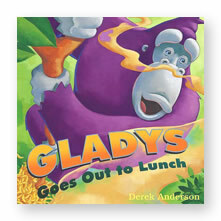 But one day Gladys smells something even better than bananas. Can she peel herself away from the zoo long enough to find out what it is? Find out in this delicious book! It's a clear night in the pond and the ducklings are supposed to be drifting off to sleep. But with all the hooting, glowing, and rustling from above, Mama fears Widdle, Waddle, Piddle, Puddle, and Little Quack might never get to sleep! Then the moon and the stars shine bright, and it looks like the ducklings might drift off after all. 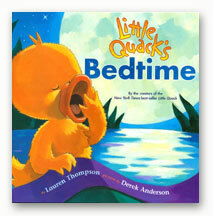 When Little Quack and the duck siblings play hide-and seek with Mama, they need to disappear by the count of ten. All the ducks find places to hide except Little Quack, who can't find anywhere secret enough to go. Can he duck out of Mama's sight long enough to win the game? Find out! And don't forget to count along with the Quack-u-lator, which pops up every time a duck disappears! When Mama Duck says it's time for her brood to paddle across the pond, the brothers Widdle, Waddle, Piddle, and Puddle all follow along. But Little Quack's not sure that he's ready to leave the nest. With just a little push from Mama and a little more confidence in himself, he may wind up the best swimmer in the bunch! 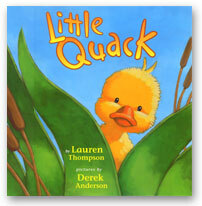 And to top it all off, readers can count along with the Quack-u-lator, which appears every time a duck casts off.